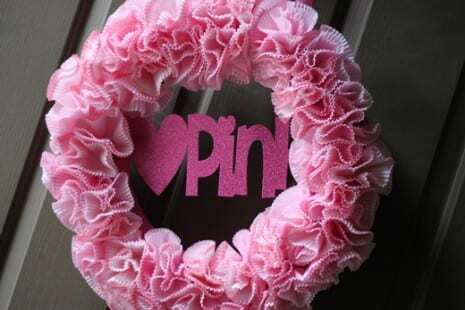 Lisa G not only make this lovely ribbon topiary for her daughter's Pink-errific 4th Birthday, but she also make this adorable cupcake liner wreath. Lisa agreed to put together this tutorial, too, showing how she made it. Lisa, thank you again. You are keeping our readers in the know, and we so appreciate it! 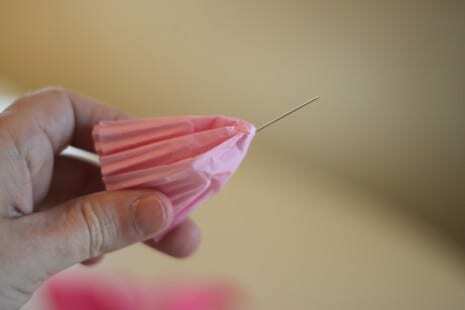 Step 2: Secure the crepe paper with two pins. 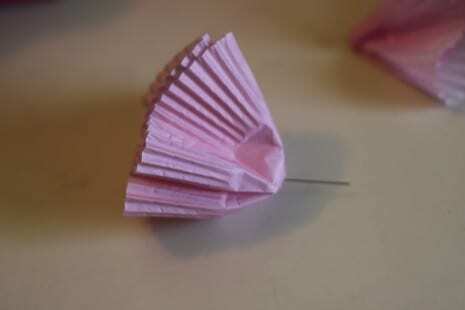 Step 3: Insert a pin through the center of two cupcake liners and bunch the liners around the pin. Step 4: Insert the pin tightly into the wreath. Step 5: Repeat until the front of the entire wreath is covered. Step 6: Fluff the cupcake liners to add more fullness. 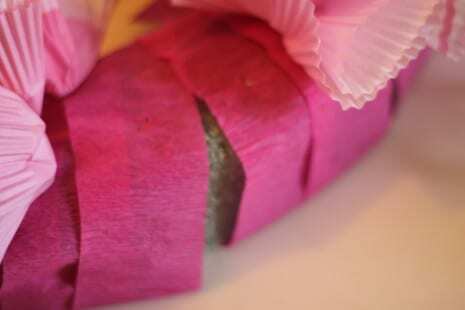 Optional Step 7: Using ribbon create a hanger and secure with pins. Thank you, Lisa, for another one of your easy-to-follow tutorials. Check out more of Lisa’s Pink-eriffic 4th Birthday here. Also, take a look at her other beautiful parties on our site and her blog Blissful Chaos. And finally, if you make your own cupcake liner wreath using this tutorial, please send photos to jillian@catchmyparty.com. I'd love to show it off! LOVE this! Can't wait to try it. Thanks for the tutorial! whats the plastic thing thats on the door? Now that I am a stay at home mommy again and have time to finally decorate our house and my girls' rooms, I am so thankful for crafty people like you who make tutorials that are easy to follow and end up with beautiful creations! Can't wait to get started! How many cupcake liners do you need to use? 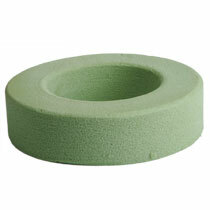 Yes how many liners are needed? Alana and Kay, I used about 100 cupcake liners I believe. It just depends on how full you want it to look. 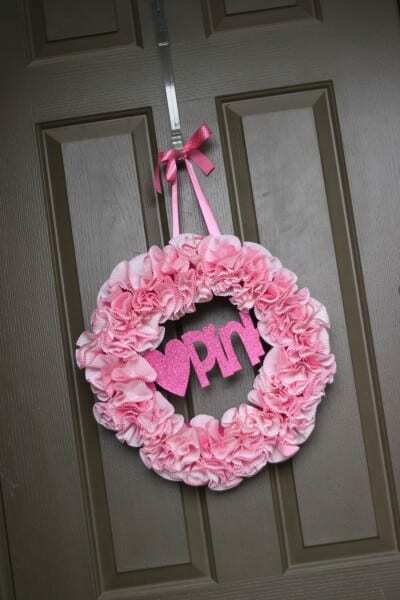 Can I ask what size wreath? Any idea how to attach wooden letters and numbers? Thanks! Thanks for sharing..love it and I will try to make it! !